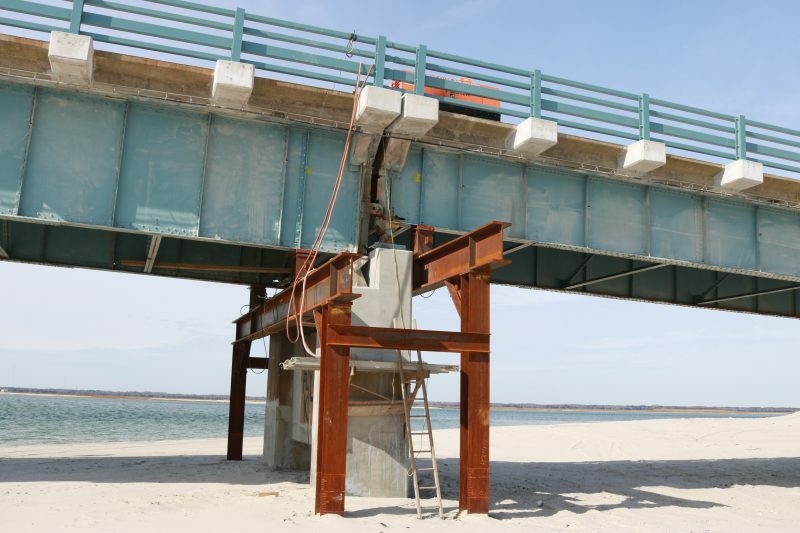 The Townsends Inlet Bridge, linking Sea Isle and Avalon is closed until May for reconstruction. Off-season construction jobs can be dicey at the Jersey Shore. Winter is the time favored by local agencies and businesses for such work, to limit the financial impact of what is largely a seasonal economy. No matter how well-planned and well-intended, sometimes Mother Nature has different ideas and her own schedule this time of year. Such, apparently is the case with the ongoing reconstruction of the Townsend’s Inlet Bridge linking Sea Isle with Avalon. 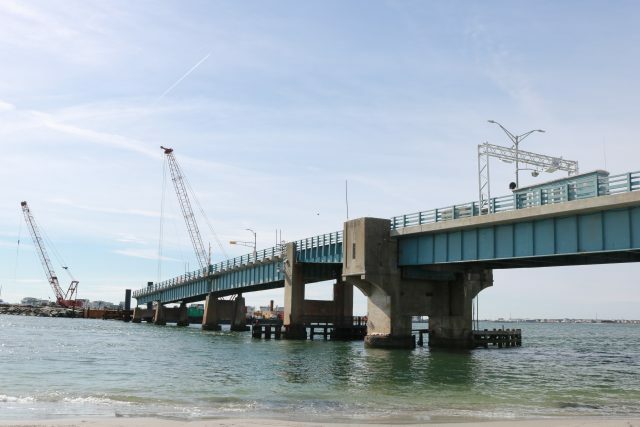 The bridge, formally known as the Ocean Drive Bridge, shut down to traffic in both directions shortly after Labor Day and a major overhaul of the badly deteriorating, nearly 80-year-old span began on September 17. Cape May County officials overseeing the project and contractor Agate Construction Co. Inc. of the Clermont section of Dennis Township are still targeting completion for May 22. Just in time for the start of the Memorial Day weekend which kicks off on the 24th. But in order to do so, it will take more manpower, and quite possibly more dollars. “It’s a bit of a setback,” Cape May County Engineer Robert Church said of several issues which cropped up during the project, and of inclement weather and rough seas. A combination of factors have hampered progress on the job, he said. “(The contractor’s work crews) are doing triple shifts” in an effort to make up for lost time, and to overcome several obstacles in the way of the job’s completion, Church said. New steel is used to support one of the concrete piers that support the bridge’s decking. The aging bridge is part of the Ocean Drive (Cape May County Road 619) scenic route which links resort towns from Ocean City to Cape May. The span has been closed periodically for maintenance in recent years. 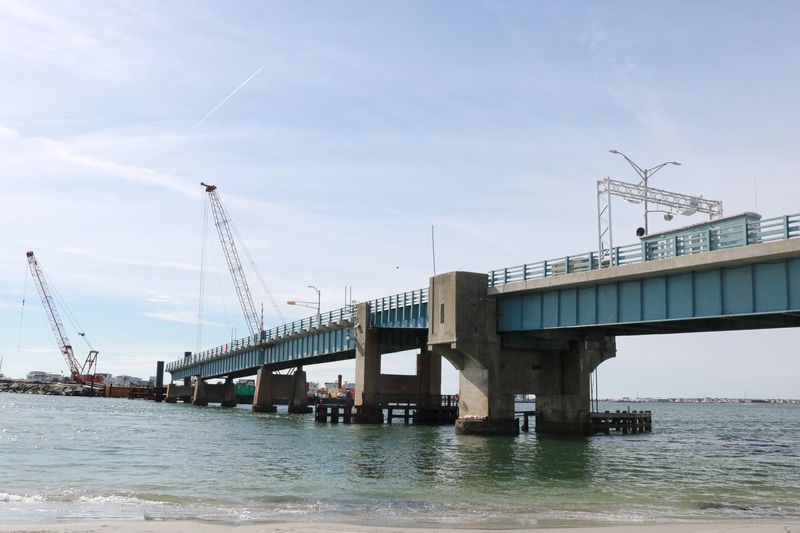 However, its most recent inspection determined that seven of the bridge’s 27 spans were crumbling beyond repair and needed to be demolished and replaced. Agate Construction was awarded the $8.6 million contract for the work, as the low bidder. The job was progressing on schedule around the first of the year, Church told Sea Isle News at the time. However, the mild parts of October and unseasonably warm parts of November gave way to snow, a Nor’easter storm, shifting gusty winds and choppy seas. The damaged sections were demolished on schedule, Church said, but when winter’s natural conditions arrived, so did snags resulting in a slowed process of building the new piers. Complicating the process, he said, was the presence of debris in the channel, which had to be removed. The first pier is completed, and the piles of piers 2 and 3 have been driven, Church said. 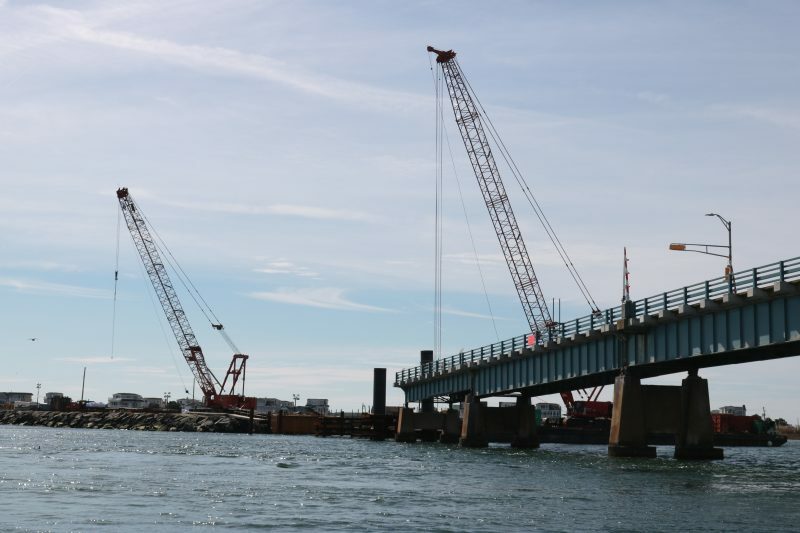 “That’s the most challenging part” of the process, he said, noting the pier caps will soon be in place, clearing the way for construction of the last four needed spans. Church had originally estimated the first three piers would be completed two weeks ago. Nevertheless, the engineer is hopeful the 24/7 shift work will soon have the project back on track with the planned timeframe. That could come at an added cost, he said. He said a construction management firm is overseeing the job on a day-by-day basis and keeping the county informed on its progress. Motorists currently have to use the Garden State Parkway to drive from Sea Isle to Avalon. Two giant construction cranes loom over the Townsends Inlet Bridge during its overhaul.